I have upgraded from twin carbs to the Weber 500, do I need a fuel pressure regulator? No not normally but you will need to consider upgrading your ignition if you want to get anything like what this upgrade has to offer and to avoid the problems with fuelling that are always apparent from any worthwhile carburettor upgrade or rebuilt replacement. Upgrading your ignition system with Magnecor plug leads and non fancy spark plugs (NGK BP6ES) is essential. 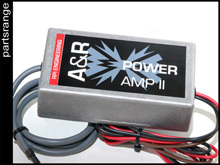 If your original distributor passes our ignition checklist and you are not able to upgrade to one of the Mallory units then at the very least you should check your cap and rotor are genuine Lucas items (Lucas will be embossed on the product) and upgrade to our RPi Power Amp for an increased ignition output. Of course if you have upgraded to the Mallory Dual Point or Unalite, then assuming you are using the coil/ballast resistor as supplied in our kit and the car and rotor arm are in good condition then this complimented with the above plug leads and spark plugs will be a good ignition setup. All of the ignition parts that we use ourselves can be found in the Ignition section of our eBay shop.